The Advertising People (from here forth to be called "The Star Makers") from Apple have uncovered another diamond in the rough. Sure, the Ting Tings were making sassy new wave and pop tunes before Apple's Ipod people got to them - but the exposure is priceless. The disco-pop track "Shut Up and Let Me Go" was the star of another enigmatic Ipod ad. 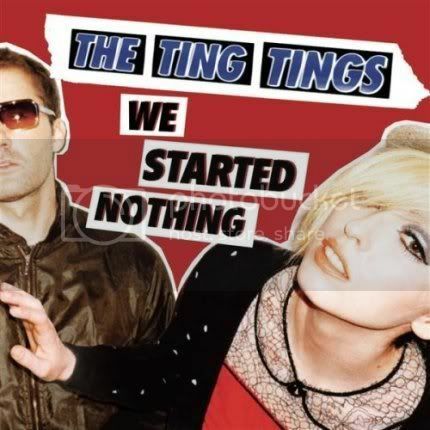 Now people are running out and buying "We Started Nothing" - the brand new album (June 2008) on which that song is featured. Why do the songs Work? It's the pop hooks that catch, but the fact is that there's actually some texture beneath the snappy lyrics and wonky beats. Tings Tings sparkplug singer Katie White (25) could be just another pretty face with a cute voice. But it's often her guitar that sells me the song. Raw and electric, it's the perfect foil to the hefty and competent beats being generated by drummer Jules De Martino (34). You don't have to look far on this album to find a track or two that will help you get through the summer heat. The great thing about a band like The Ting Tings, is that they are so hot that they will always be connected to the time in which they became famous. Meet one of the most fiery bands of 2008! Ting Tings tour dates are selling out. If you don't have tickets - you probably won't be going to see them this time around. Check the dates here.